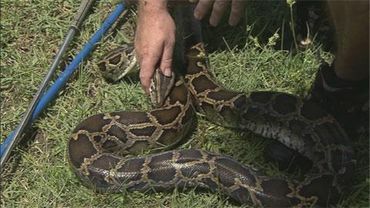 WESTERN BROWARD COUNTY, Fla. -- Snake hunters went into the Everglades on Friday, day one of an effort to eradicate Burmese pythons from the area. More than 100,000 pythons are believed to be living and breeding in the Everglades. Pythons are not native to Florida, and they have no natural predators in the state. "We found that they're eating pretty much anything out here -- dozens of species of birds and mammals. This is a serious problem, and as you know, the Everglades has a number of threatened and endangered species," said Everglades biologist Dave Hallac. Three men, experienced in handling snakes, were the first to be licensed by the state to hunt and kill pythons found in the wild. The men boarded an air boat Friday morning with Florida Fish & Wildlife managers to head deep into the Everglades to search for pythons. "It's probably going to be very difficult to find them. Certain times of the year are going to be better, when it's cooler, when the animals are out trying to catch sunlight, versus warmer periods when they're going to be hiding," said Gregg Graziani, who was among the first to be licensed. Michael Cole and Shawn Heflick are the other two hunters who have been licensed by the state. The three men have a combined 88 years of experience in handling snakes and other reptiles. "The only thing we're requesting is a digital picture. We're requesting the stomach contents of the python, the size and the GPS of where they caught them," said Florida Fish and Wildlife Conservation Commission Chairman Rodney Barreto. Biologists hope the information will help experts better understand the creatures and reveal new ways to lead to eradicate the species from the Everglades. "The animals will be euthanized on sight. These animals will not go back into the pet trade," Graziani said. The hunters' first airboat ride into the Everglades Friday was intended to be nothing more than a snake survey, but it quickly became a hunt when snake handlers picked off their first python. "It just shows you the proliferation of these snakes in the Everglades," Barreto said. The python was estimated to be three or four years old, most likely born in the wild, and it had grown an impressive 9 feet 8 inches long. Clearly, the animal was not malnourished and could do a lot of damage to native species, experts said. �We need to protect the native wildlife and we need to eradicate pythons. Pythons have no enemies. Think about that -- that snake will take on a 10-foot alligator," Barreto said. The experience snake handlers were able to kill the first python quickly and simply. All they did was make a cut behind the brain, severing the brain cortex and the spinal cord. After that, FWC officers tried to determine what the snake had been feeding on. "Actually, all we found in the stomach and lower intestine was rat hair and a little bit of rat bones," Heflick said. The problem with pythons has long been traced to pet owners who dump the snakes into the wild after realizing that they can grow up to 26 feet long and weigh up to 200 pounds. Two weeks ago, a 2-year-old girl in Central Florida was strangled by a pet python that escaped from its cage. The new move to hunt wild snakes is only the beginning of what Florida wildlife officers consider a complex but necessary solution. The python hunting program is in its first phase and will last for three months. If proven successful, the program will be expanded to allow for more licensed hunters, but as of now, only 10 can be licensed under state law. These beautiful animals didn't ask to become a 'pet'; they didn't ask to be 'dumped'...and yet because of humans' STUPIDITY they will die! HOW fair Iis THAT?! When will people LEARN?! Good! This invasive species must be destroyed before all of the native birds and small animals die. In Vermont, we have an invasive wetland plant that is killing all the native wetland plants. To the other wetland wildlife, it has no food value, so it is starving our moose. Invasive species are always moved from the ecosystem in which they evolved to other ecosystems, either by human greed or vanity, but in the other ecosystems they wreak destruction and death. Thank you Raffi for sharing! Humans kill every animal that moves, and even ones that dont. Thank you Raffi. I for one believe that they shouldn't even be sold as pets. We're causing enough damage to the environment without us dumping unwanted exotics into our rivers, lakes, streams and neighborhoods. This makes my blood boil. The people that created this situation should pay harsh penalties. These snakes were ruthlessly taken from their natural habitats and now they are paying for it with their lives. Thanks for all your comments everyone. And ironically it is just possible that some of the "owners" of these "pets" are the same ones who are lining up to hunt them down-decades and decades of this disposable mentality -releasing these animals into the Glades and the damage done by Hurricane Andrew to several pet shops have been the main contributors to bringing this about. It would be good to see them shipped back to whence they came but that is asking for a miracle. The traders who sold these pythons to dumb people who thought these would be pets should be jailed. You can't let them stay where they don't belong. Reminds me of mongoose in Hawaii.they were brought in to control something, can't remember, but now mongoose are everywhere. You can see them walking down the road. I completely agree that the responsibiliyy for their deaths was born in the human ego to have exotic pets. That these same humans released them into the wild when they could not longer manage the animals needs as the animals grew to their full size. I agree that they animals are not responsible and are victims themselves. But their taking over in another ecosystem and destruction of the other ecosystem has to end while South Florida still has some of it native wildlife left alive. again people are not responsable enof to have these animal's as pet's and why whould you want to,i blame the government they shud have pass't law's a long time ago,banning people from ownning exotic animal's of anykind they are beuitiful but they have there place,it is just so sad that this has to happen,only at the hand's of man again do the animal's suffer. the snakes should never be kept as pets, wild animals and exotic species should never be pets, it's not the snake's fault for being dumped, it's trying to survive just like any other species, if people hadn't dumped them there wouldn't be a problem, so now the snakes have to die because people are stupid. i grew up in south florida and i do remember people did the same thing with green iguanas, they were everywhere, they'd get too big and people would dump them by the canals and swamps, we'd see them on the side of the roads in the canals, it's horrible, these animals should never be kept by people like that.